Dainin Katagiri (1928-1990) was a Japanese Zen Buddhist teacher in the Soto lineage. He is best known for being the first abbot of the Minnesota Zen Meditation Center. Many of his students have gone on to be influential Western Buddhist leaders. Katagiri was born in Osaka, Japan. He trained at Eiheiji monastery for three years. 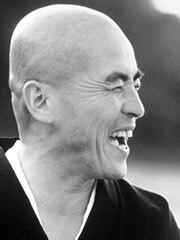 In 1963, he came to the United States to the Zenshuji Soto Zen Mission in Los Angeles, and later moved to San Francisco Zen Center, where he assisted Shunryu Suzuki. Katagiri went on to help found the Minnesota Zen Center. In 1984, following the removal of Suzuki’s successor, Richard Baker from the abbacy of the San Francisco Zen Center, Katagiri served as acting abbot. In 1986, Reb Anderson became abbot of SFZC and Katagiri returned to Minnesota, where he remained until his death in 1990.